Wonderful outdoor lighting is one of the cheapest and most creative ways you can enhance your outdoor areas. A humble balcony may be quite simple during the daytime. 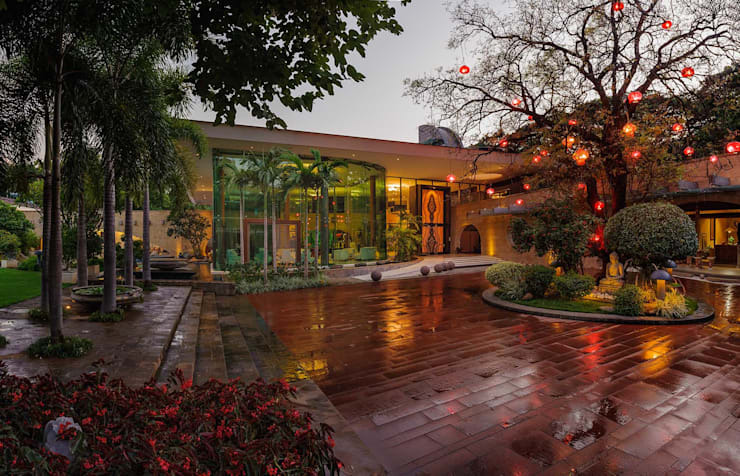 But at night it could become a place of magic and mystery once you have set it aglow with lamps, string-lights and solar lights. 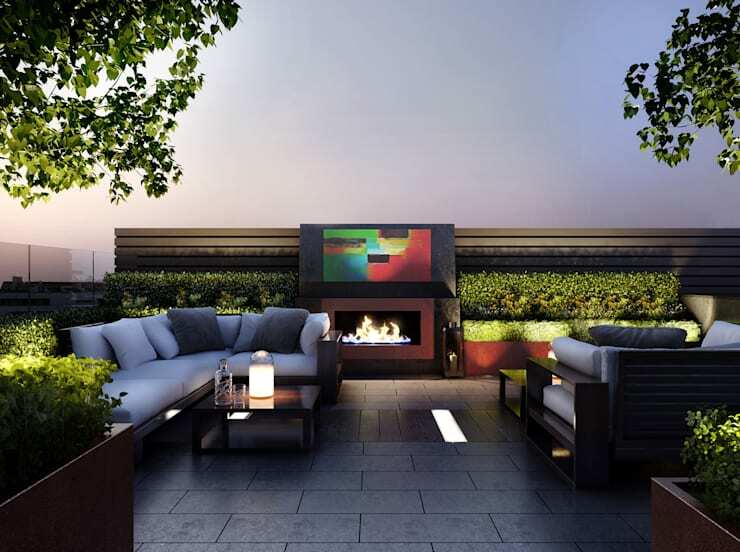 Clever lighting is a very easy way to transform outdoor spaces into a true extension of your living space. Outdoor furnishings often need to be quite minimal for space and other practical reasons. So your lighting scheme will really set the mood, separate zones and focus attention on the natural benefits of the space. The past few years have seen a fabulous explosion in the lighting market. With worldwide changes in legislation and the demand for more energy efficient lighting, lights are cheaper, more powerful and imaginative than ever before. So let's get on with exploring a few great outdoor lighting ideas. As usual, we will illustrate our tips with a few, fantastic photos. Enjoy! Chances are that your outdoor areas will be used for relaxing and entertaining. So it's good to avoid harsh spotlights and focus on creating an atmosphere by layering your light with lots of different, soft points of illumination. If you do like spotlights, it's important to direct them away from where you are sitting to avoid uncomfortable glare. See how effectively they have been used here to highlight the garden hedge in the background. To get a good sense of how layering looks, note the lighting scheme has been built up with garden spotlights, small table lamp and ground panel lights. A collection of swaying tree lamps can really set the summery mood. Tree branches and natural foliage possess the kind of lovely, organic lines that are often missing from dense urban settings. It's always a good thing to highlight the natural elements in your outdoor areas. Let's not forget how atmospheric they can be when there's a little breeze in the air. 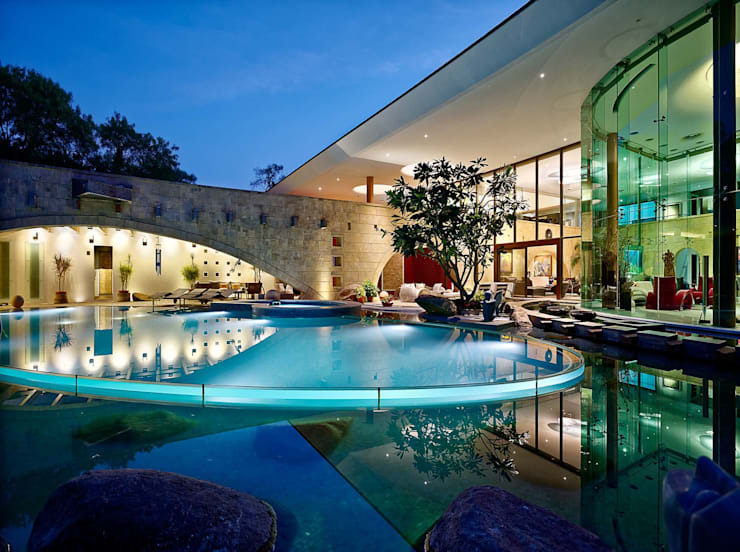 This is one impressive pool with impressive underwater lighting. This look could easily be applied to any kind of water feature. To really amp up the watery aesthetic, consider investing in a good, submerged light. It will add a whole other level of sophistication to your outdoor space. Water and electricity are obviously not a good mix, so it's important to invest in quality! A fire pit will create a natural gathering point in your outdoor area. Of course, it could even be used as an outdoor barbeque. 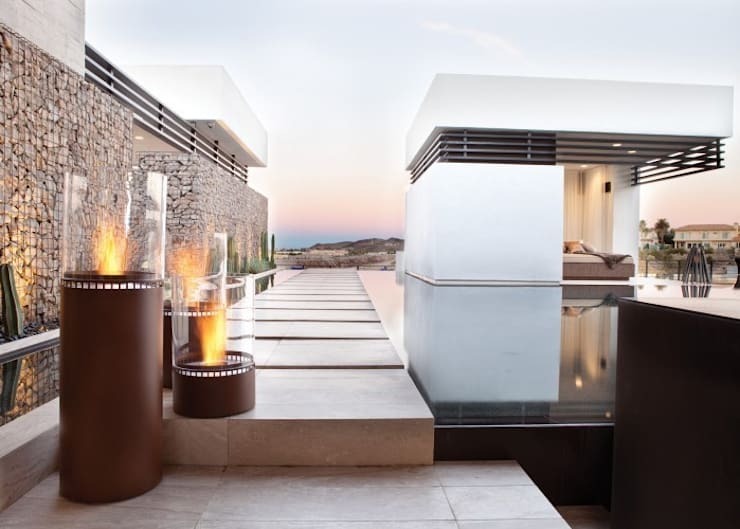 If your balcony or rooftop is too small for a ground level fire pit, consider a standing fire feature like this one by Ilumina. It's simple, sophisticated and perfect for a small outdoor space. Ground Lights are an essential part of your lighting plan. 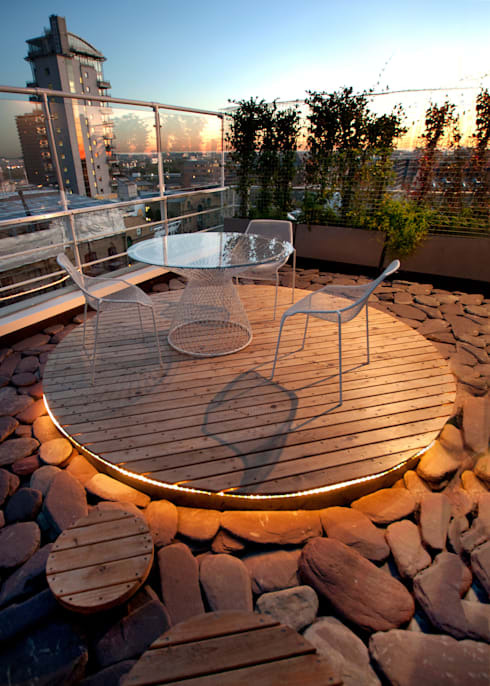 As seen here, they can be used to create very unobtrusive light when hidden beneath decking. But if you do choose something like this, be careful not to go overboard. Just choose one point of focus and add pieces selectively. Mit den LUMENIO LED Kugeln zaubern Sie stimmungsvolles Licht—auf jeder Terrasse! As mentioned earlier, lighting options have really exploded in recent years. 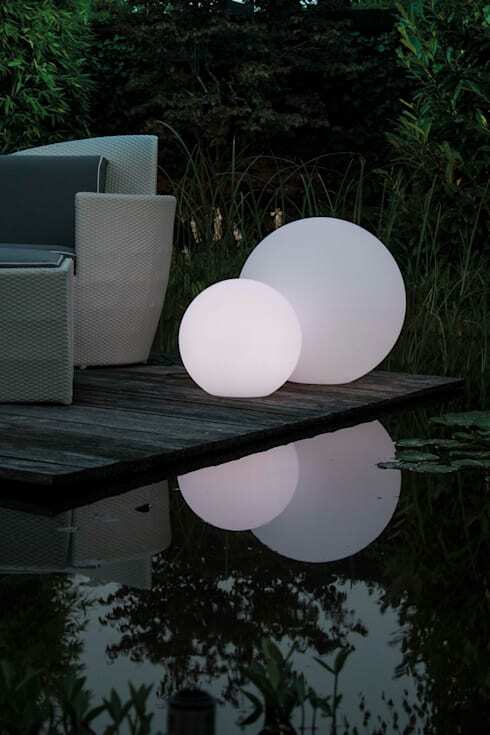 These round, organic spheres act as garden sculptures and extremely subtle garden lights. They are both easy on the eye and solar powered. They are even available in the form of pot plants. If you are interested in refreshing your outdoor areas, you would love this Ideabook How to make the most of your small courtyard. What do you think of these outdoor lighting ideas? Can you think of any more? We would love to hear in the comments below.